A Muslim hate preacher, who has called the Queen a terrorist was prosecuted for labeling a woman in tight jeans a “prostitute”, has launched a YouTube channel where he records himself confronting and abusing police. Outside a Birmingham court this September, Krissoni Henderson vowed “continue to fight you police officers” after being found guilty of a “racially aggravated” public order offense and using “threatening words and behavior”. 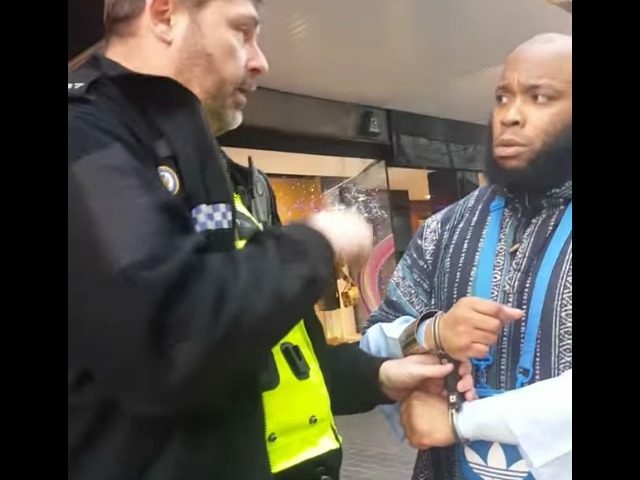 A video of Mr. Henderson went viral in July, where he was seen yelling “Allah hu Akbar” at a policeman who had intervened when the preacher began harassing a woman in tight jeans as she watched a Christian preacher. Now, a couple of months after his conviction, Mr. Henderson is sticking to his vow to “fight” the police, by uploading dozens of videos of him randomly approaching officers around Birmingham, calling them “racist”, and promising to “use the footage in a court of law”. The channel is called “the black Jason Bourne”, and in one of the most shocking videos he repeatedly asks a policeman “don’t you know you I am?” in an aggressive tone. In the video – titled “BREACH OF HUMAN RIGHTS AGAIN!” – he appears to be angered that a man rode his bike close to his wife and son. The man on the bike, however, claims Mr. Henderson kicked him off his bike for no reason. “When you people walking their baby sons in a pram you don’t ride your bike into them, because by law I’m allowed to defend myself”, he says in the footage. In other videos, he stands in front of police vans shouting at offers, harasses probation officers in a police station, and even films himself getting released from custody – all whilst claiming his “human rights” have been breached.